224 pages | 20 Color Illus. | 37 B/W Illus. 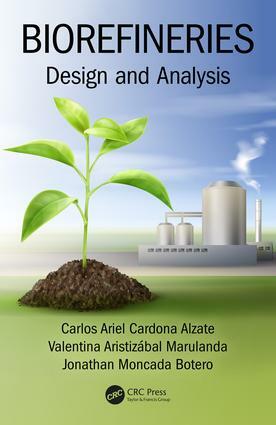 Aimed at presenting a systematic design of biorefineries, the book initiates with an overview about relevance and applications explained through origin of raw materials, transformation routes and products. Then, concepts as hierarchy, sequencing and integration are considered which helps in generating a sustainable and strategic design of biorefineries. Further, framework for biorefineries based on techno-economic, environmental and social aspects is analyzed with examples to show the applications. Finally, some mass, energy and economic indices are considered to assess the biorefinery sustainability and key challenges for future development of biorefineries. "Biorefineries: Design and Analysis presents current state-of the-art of the biorefineries design and analyses for in depth understanding of biofuels and biomaterials; explores conceptual design of processes; presents concepts discussed with strong engineering approach, including design strategies and techno-economic analyses; includes bio-based materials, natural products and food products in the biorefinery concept; and presents a structured method to calculate indices of performance of biorefineries. Critique: A seminal work of a groundbreaking technology, Biorefineries: Design and Analysis is impressively well organized and presented, making it an ideal and unreservedly recommended addition to professional, corporate, governmental, college, and university library Chemical Engineering collections in general, and Biorefinery supplemental studies lists in particular." 4.2 Problem definition. Selection of sequencing lines (Process pathways). Biorefining alternatives. Raw material integration. Mass integration. Carlos A. Cardona Alzate is full professor in Chemical Engineering Department at the Universidad Nacional de Colombia sede Manizales since 1995. He received M.Sc. and Ph.D. degrees in Chemical Engineering from the Moscow State Academy of Fine Chemical Technology M.V. Lomonosov in 1995. From 1996 to 1997, he worked at Universidad de Caldas supporting a new program in Food Engineering. Dr. Cardona’s research focuses on developing non-conventional separation processes, thermodynamics, integration processes, process engineering, biorefineries, climate change and agroindustry. In particular, he has worked on different research projects concerning the chemical and biochemical process design, biofuels research and development, economic and sustainable utilization of Colombia agroindustrial wastes, among others. He has authored and co-authored over 150 research papers as well as 12 research books and 44 book chapters. Additionally, he has presented over 250 works at scientific events. Currently, he leads the research group in Chemical, Catalytic and Biotechnological Processes (PQCB) at Universidad Nacional de Colombia sede Manizales. Jonathan Moncada Botero received a Chemical Engineer and M.Sc. (Laureate distinction) degrees from Universidad Nacional de Colombia sede Manizales in 2010 and 2012, respectively. Since 2014, he has worked as a junior researcher and at the same time, he has developed his Ph.D. in sustainability assessment of biorefinery systems at Utrecht University (The Netherlands), Copernicus Institute for Sustainable Development. M.Sc. Moncada has scientific expertise in topics such as, techno-economic analysis, sustainability assessments, biorefineries, process modelling and simulation, Aspen Plus and life cycle assessment (LCA). In particular, he has worked on different research projects concerning the modeling, techno-economic and environmental assessment of processes and biorefineries. He has authored and co-authored over 25 research papers as well as 4 book chapters. Additionally, he has presented over 30 works at scientific events. Valentina Aristizábal-Marulanda received Chemical Engineer and M.Sc. degrees from Universidad Nacional de Colombia sede Manizales in 2013 and 2015, respectively. Aristizábal's research focuses on processes engineering, process modelling and simulation, design and analysis of biorefinery configurations considering technical, economic, environmental and social aspects. She has worked in the production of jet fuel through furfural platform and in the development of projects related to the valorization of residues. She has authored and co-authored over 6 research papers as well as 5 book chapters. She has given over 33 works in scientific events. M.Sc. Aristizábal has done internships at University of Salamanca (Spain) and University of Minho. Currently, she is Doctoral candidate in Engineering - Chemical Engineering at Universidad Nacional de Colombia sede Manizales and she was qualified as Junior Researcher in 2017 by the Departamento Administrativo de Ciencia, Tecnología e Innovación (Colciencias) in Colombia.